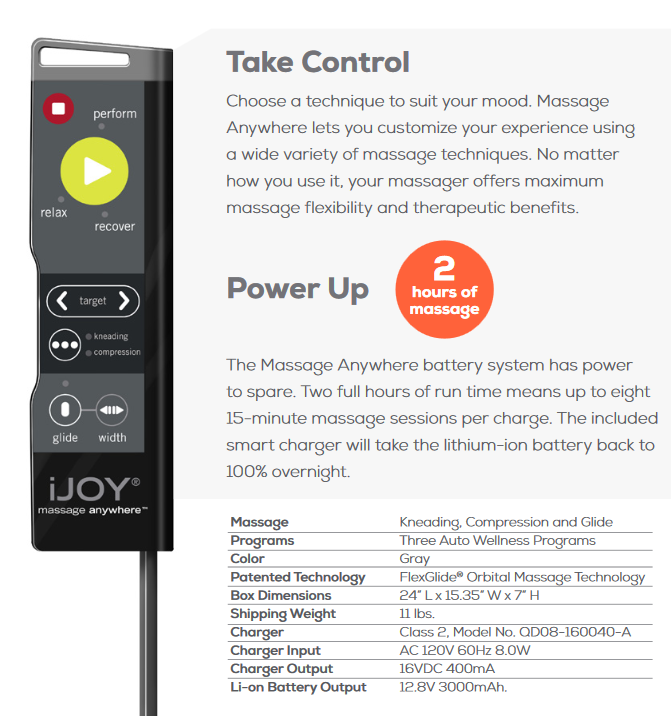 If you suffer from chronic back pain, are athletic, or just find the benefits of regular massage help to relieve stress and relax and rejuvenate your body and mind, the portable iJoy Massage Anywhere from Human Touch is an excellent option. Massage chairs are a great home alternative to regular, expensive trips to the day spa or visits to a physical therapist. But those aren't cheap either. They also aren't portable, which is why the iJoy Anywhere has bridged the gap between therapy, price, and portability. The reviews from users who have purchased the Anywhere Portable are consistent in their refrain. Users love this little on-the-go beauty. To see for ourselves, we've taken a look at the specs and dug deeper into the research to find the benefits as well as the downsides. The Anywhere Portable contains iJoy's patented, super powerful orbital massage, which is available in the iJoy Active massage chair. This technology duplicates the feel of a massage you would obtain from a professional, using the same techniques to ease sore muscles, relieve back pain, increase relaxation, reduce stress, and recharge the body and mind. The specially designed robotics enable the massage to glide over your back, delivering the ultimate relaxation without any friction or pinching. There are three built-in massage programs to choose from. Relax is the perfect way to end the day or decompress after a stressful meeting or hectic morning. Recover is a great rejuvenator after a hard workout or travel day. Perform is the perfect afternoon pick-me-up or pre-gym massage to get your mind and body energized and ready to take on whatever challenge comes your way. Each of the programs were developed by professional wellness experts. You can use the remote control to change between any of the preset programs or adjust your settings. You can either remove it from the unit and use it as a traditional hand-held remote, or you can leave it docked, onboard, and turn it on or off and select your desired program with a touch. 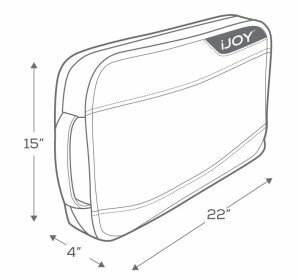 One of the best features of the iJoy Anywhere is that you can use it anywhere on your body that you have pain, discomfort, or stress. It's great for resting against to soothe sore, tired back muscles. And it's effective on calves, feet, legs, arms, and shoulders. All you need is a surface to rest against, and in any position that is comfortable, you can grab a quick break for pain relief, or to relax and refresh. The name says it all. For one, it's portable; but it's also easy to carry around. It comes with a thick, adjustable, sturdy shoulder strap that is made from durable fabric, so it will last and won't tear or fray. It also has handles for easy positioning and moving around. The fact that so many of us are overworked, overtired, and overstressed these days means more of us are looking for solutions to destress at work. It's a sad fact that we are incorporating more and more relaxing techniques into the workplace instead of just doing less work. But facts are facts. Research has shown that massage at work has many benefits. 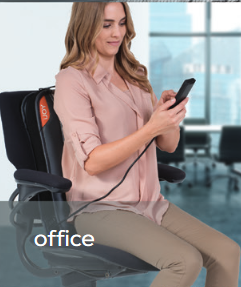 If you aren't one of the lucky ones who happens to work for a forward-looking company that supplies on-site massage or massage chairs, the Portable Anywhere is an excellent therapeutic benefit you can take into your own hands. Toss it in the car with your briefcase, and that 30-minute mid-day refresher will change your outlook and performance. Not to mention state of mind. The unit is cordless, being powered by a rechargeable lithium-ion battery. This also increases portability, flexibility, and empowerment. A full charge renders two hours of massage, which translates into eight massage sessions between charging. So, you can relax and rejuvenate on the go without having to worry about finding somewhere to plug in. It also comes with a smart charger included, which charges the battery up overnight. Massage technology. The advanced robotic flexglide massage is hard to beat. There are plenty of good portable chair massagers out there, but for this level of top of the line performance, you're getting a high quality, deep tissue, chair-level type of professional massage in a very attractive portable device. Portability. With the ability to use the massager almost anywhere, there are few models that can beat this aspect. 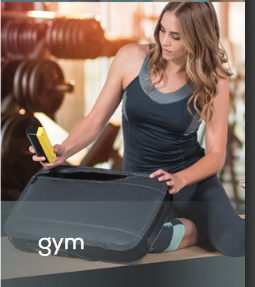 You can use it at home, at the gym, studio, office, on vacation, literally anywhere you need it. It's also light (eleven pounds), easy to carry, and is made of high quality and durable material, so it's built to last. Its modern design makes for an attractive massager as well. Battery and charger. With the advanced lithium battery, you get ample battery life and a quick recharge system. The ability to go cordless is a huge perk. Quiet. Quieter than most massaging machines, the lack of noise motor makes this another great choice. It increases not only your ability to use it on the go, but your level of relaxation when you don't have to worry about noise. Warranty. You get a one-year warranty with purchase. Heat. There is no heat option due to the portable design and battery. Heating would just take too much power. It's a fair trade-off, we think, but if you can't live without heat, you'll have to look elsewhere. Size. Another trade-off due to its portable nature, but if you're looking for a larger unit, one that would cover your entire back and or seat and neck, this one won't fit the bill. At 22 inches long, you do have to move it around to hit all areas of the body if you're going for a full-body experience. Shape.Massageanywhere is a rectangle, and its compact size is part of what makes it great. It's not, however, contoured in any way, so if you want something that will conform to the shape of your neck or shoulder, you won't get that here. Massage variability. While the massage itself is technologically advanced and very effective, you aren't going to get the types of choices you get with a chair. For example, there are no air bags or cells, or compression, stretching, twisting, tapping, kneading, or shiatsu. Your choices are limited due to the simplicity of the design and intent. If you're looking for a product that packs a lot of benefits in a small package, the Portable Massager from iJoy is a great bet. It's easy to use, and delivers on its promise. 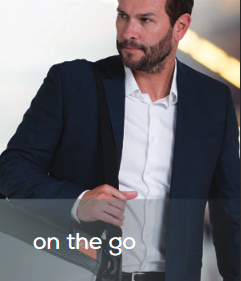 You can take it iJoy Massager anywhere you go, anytime you want, and massage your way to better health and wellness and greater relaxation and stress relief.